For some time now, Barcelona has been a dream destination for LGBTI tourists from all over the world. The Catalan capital is an open, cosmopolitan city where gays, lesbians, bisexuals, transsexuals and intersexed will find an atmosphere of freedom, tolerance and respect. The reason for that is, since the 1970s, there has been a good number of groups and associations that have shown concern and fought tirelessly for the rights of everyone, something they are still doing today. A good example of that is the Catalan Parliament's passing of the Anti-Homophobia Act, a pioneering piece of legislation in Spain promoted by a large number of associations. You can see Barcelona's diversity for yourself inparts of the city such as Gaixample, an area of the Eixample where there are lots of bars, discos, clubs, restaurants, clothes shops, hairdressers, saunas and even hotels for homosexuals. But the best thing about Catalonia's capital is that gay life spreads right across the city, even to places such as the Raval, Poble-sec and Poblenou. There are lots of clubs too that normally attract a heterosexual public but occasionally offer entertainment for gays and lesbians which are a big hit with the locals. Barcelona holds numerous events aimed at the LGBTI community, especially in the warmest months of the year. The gay summer kicks off around 28 June with the Pride celebrations, a week of events which ends with a big parade that fills Avinguda del Paral·lel with floats. The other big event of the season is the Circuit Festival, with lots of muscles, house music, swimming pools and the beach, which attracts thousands of tourists from all over the world. But it's not all partying and nightlife. The city also holds two gay and lesbian film festivals between the months of July and October, plus LGBTI sports tournaments, such as the Panteresports in September. With all that we mustn't forget the big association network formed by dozens of organisations involving lesbians, bears and transsexuals that organise events and activities throughout the year. All these ingredients make Barcelona the LGBI capital of the Mediterranean, a reference point for gays and lesbians all over the planet. Since 1994 there has been a multi-sport club in Barcelona offering gays, lesbians, bisexuals and transsexuals a place where they can do sport freely and in a relaxed atmosphere. We are talking about the Panteres Grogues, an association with around 20 sections and over 700 members. Catalonia has been a pioneering country as far as defending the rights of gays and lesbians goes. That is thanks to the work of organisations such as the Casal Lambda which, since 1976, has offered the LGBTI community a place to meet. The Gay and Lesbian Family Association (FLG) has its centre there. There are also organisations in Barcelona concerned about promoting and providing quality care services for gays, lesbians and transsexuals faced with illness, disability or dependency. The Enllaç Foundation, which looks after the welfare of LGBTI people, is one of these. The large number of LGBTI associations in Barcelona is a good indication of the city's diversity. There are associations for everybody: business people, homosexual Catholics or pro-independence gays. Some of the most popular can be found at this link. The lure of Catalonia for the LGBTI community stretches beyond Barcelona. Sitges, a town with a big gay scene and loads of gay-friendly bars, is a must. And along the coast there are lots of beaches for homosexuals and quieter towns that target family tourism. Barcelona has a travel agent's with activities specifically for the LGBTI community. It's called Rainbow Barcelona Tours and it organises excursions with gays and lesbians in mind. Its guides organise activities tailored to its clientele and in various languages. At the heart of the Gaixample, or "Gay Eixample" district, there is a veritable institution of the Barcelona scene: Axel, the first openly gay hotel in the city. It opened in 2003 and has a terrace that is very popular in the summer months. There are two bookshops in Barcelona that specialise in gay and lesbian literature, so people can have points of reference, whether or not they belong to the LGBTI community. In fact, Antinous has been working to that end for over 15 years. This bookshop, which opened in 1994, is run by two women with drive: Connie Dagas and Hella Brün. They also run Egales, a company that publishes books that may be of interest to their customers. So far they have published more than three hundred. This is without doubt the "gayest" beach in the city and it also has a place for nudism. It attracts all kinds of people, lads keen to show off their muscles most of all. It has a popular chiringuito, or beach bar, that organises lots of activities in the summer months. Barcelona's beaches have a very mixed set of bathers who all get on fine. Some have places for sport, beach volleyball tournaments, for example, some are more for families, while others welcome nudists without any problem. Barcelona is an open city, so gays and lesbians are welcome in all restaurants. But in the Gaixample district you can also find establishments with a better understanding than others. Barcelona has plenty of bars for homosexuals. 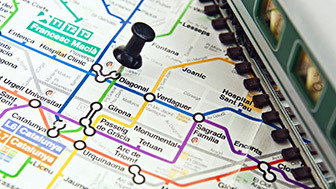 Many of them are in an area of the Eixample district known as the Gaixample. There you'll find various place to go for a drink and a dance. Some of the favourite haunts of the locals can be found in Raval. It's easy to stay out well into the early hours in Barcelona any day of the week. At classic gay clubs like Arena or Metro, for example. There are lots of night-time haunts that also organise monthly entertainment for the LGBTI community. Keep your eye on the events calendar. Although the range of places for lesbians is not as wide as it is for gay men, there are a few places in Barcelona that are just for girls. A few are real classics, such as Aire and Rosa. There you can find out about the entertainment organised each month. Thousands of men travel to the city to enjoy the party atmosphere of this festival. 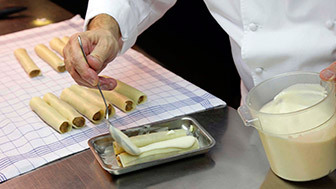 Barcelona offers a good example of the marvels of Mediterranean cuisine.